answers, information, education and support. Get connected to the COPD Email Community! The COPD List is an electronic mailing list, and our main program. Any member of the List may "post" to it, and, after the email is sent, it is redistributed automatically to all the List's subscribers. It is available in two formats, Regular or Digest. Regular is as-they-are-posted e-mail messages and Digest is a compiled e-mail message containing all the email messages of the day - to keep files sizes acceptable for all ISPs, Digest is sent out in sections, 2 or 3 per day depending on the volume and size of mail. If you are not computer-savvy, we recommend that you get your emails individually (Membership type: regular) rather than Digest delivery, they are much easier to read and respond to. Check your inbox after you submit your subscription, we will have sent you an email that you must reply to prior to you being added to our email list. This will prevent anyone else from enrolling with your email-id. Also, please read the page that comes up after you click the Submit button for more hints. Thanks for your helping hand! Subscribing means you are agreeing to follow all our policies. to exercise, but may lack motivation to follow through. Especially for those who live alone and want to receive a daily check-in. Volunteers share their lives, especially for those feeling disconnected. Sign up to receive greetings from the COPD Email List on your special day. Emails should be sent in Plain Text - this is generally an option under the "Format Text" tab of your email program. Email with attachments, styled fonts and colors, and HTML coding can be treated as possible spam/viruses and rejected by the Mail List server or posted with a lot of garbage. Doing only the "Basic" is just fine for those new to the list. Our focus is COPD, not messaging expertise! Open the Digest email, use your cursor to highlight the message you are replying to and click on "Reply" icon. Depending on your email program, it will include a copy of what you highlighted. If, however, your new email contains the entire digest, you will need to delete everything above and below the message you are replying to, then add your response above it. Also, change the Subject: line to match the message you are replying to rather than "COPD Digest.......etc." "Reply All" sends your reply to the original poster and to the whole list. To send just to the original poster, click on "Reply". To send just to the List, click on "Reply All" but then go to the address area of your reply message and delete the original poster's address. To reply to Digest messages or initiate a new message, you must manually enter COPD@HOME.EASE.LSOFT.COM, or an individual's address, in the address line in your reply message. These last two "manual" entries are simple if you add COPD@HOME.EASE.LSOFT.COM to your email program's Address Book/Contacts. Most people quickly scan the subject lines in their inbox before deciding which messages are worth their time and attention. Choose the wording for your Subject line thoughtfully. New messages and replies to messages received inside the Digest List, require manual entry in the Subject area of your message. where you type in what you want to say or ask. If you are replying, quoting some of the original message is a big help for others to understand what the message is about. Experienced computer users quote judiciously. They include just enough of the original text in their replies so readers can quickly understand the new message. They avoid over-quoting: including so much of the original that readers lose interest in the reply. Just write the change you want in the body of the email and press Send. For all other changes such as changing your email address use the link above. The changes are accomplished using the programmed emails below, but they must be submitted from the email id you used to join the COPD List. If you sometimes use more than one computer or email address, make sure any change request is from the subscription email address. Just click on the action below that you want taken. When the email pops up, send it. A confirmation will be emailed to you shortly thereafter. 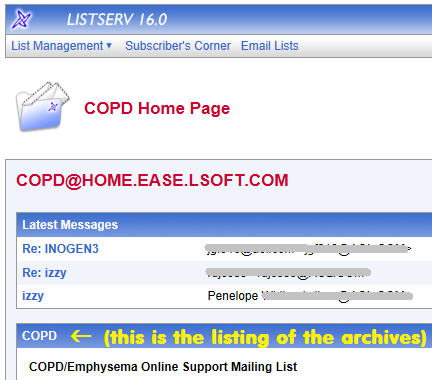 The COPD List is hosted on LSOFT, a large professional Mail List vendor. They maintain the searchable archives for the COPD List. A password is required as a security measure to make certain that only our subscribers are accessing the information. Thank you for your patience! LSOFT requires a LISTSERVE password which takes a little fiddle to set up the first time (you click to send them the password, they send an e-mail back to you in order to verify you really are at the e-mail address you gave them, and then you re-try requesting access). This process may take 15 minutes but then your LISTSERVE password makes it easy for subsequent access. Your password is whatever you want it to be as long as it fits into the field provided. It works best if you have cookies enabled on your computer. If you do not have cookies enabled, you will need to enter your password each time you access the archives. Tip for your first access of the Archive page - after entering your password, be sure to scroll down on the response screen; you might be on the Archive page and not realize it! Don't worry this can only happen the initial time you use your password, you won't have this problem ever again - we promise. This is a partial image of the COPD Archives page. Notice where the archives listing actually begins, after the listing of the Latest Messages. If you are an AOL user, there is a problem if you rely on AOL to automatically add to your contacts list; and it is also possible your privacy settings may block our emails. AOL has automatically added management@copd-support.com to your contacts list, but this is not the email address that will be sending emails from the COPD-Support List to you. You cannot rely on the AOL automatic contact adds. Also check your privacy settings to make sure our emails qualify. How do I add contacts in AOL Mail? How do I unblock an email address in AOL Mail? How do I reset my mailbox settings in AOL Mail? Once you have added COPD@HOME.EASE.LSOFT.COM, and listserv@home.ease.lsoft.com to your contacts list, you should receive at least one e-mail daily (the Chat Schedule); if you do not, then you know your privacy settings are not correct.